The American Automobile Association (AAA) informed Marival Residences & World Spa that it had been conferred with the Four Diamond Award due to the quality of the services it offers to its visitors. 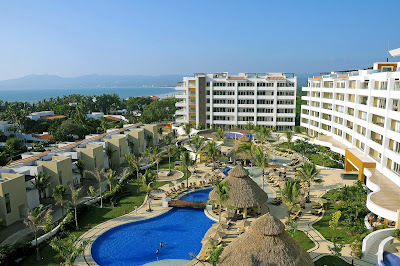 This is a result of the constant work that members of the Hotel and Motel Association of Bahia de Banderas are making to improve their touristic products, which are placing Riviera Nayarit as one of the leading destinations in terms of the number of resorts that have been awarded by the AAA. Marival Residences & World Spa is an innovative resort that offers exceptional residences that combine detail and luxury with personalized services. It also allows its guests to choose between a luxurious all-inclusive plan and the traditional European plan, with a wide range of additional services. It was this very concept and the detailed attention of their personnel which allowed the resort to obtain the prestigious AAA award, which is only granted to 4% of the more than 31,000 establishments evaluated by the organization worldwide, in order to offer reliable information to its more than 52 million associates. The Four Diamond Award received by Marival Residences & World Spa evidences the constant work being made in Riviera Nayarit to consolidate a destination that’s appealing for tourism. Travel experiences were qualified by visitors as “completely satisfactory”, at polls made in 2010. According with this study, the average rating for ‘Travel experience satisfaction’ was 9 out of 10 points, encompassing a 9.4 in hospitality, 9.1 in tourist safety, 9.2 in hygiene, and 8.8 in information availability. The Convention and Visitors Bureau (CVB) of Riviera Nayarit congratulates Grupo Marival for its Four Diamond AAA Award, with the conviction that this type of recognition is an important factor to attract tourists, which contributes to consolidate our destination as one of the most important in Mexico.